Have you wondered how to integrate PTZ Cameras into your live setup? PTZ stands for “pan/tilt/zoom” and refer to robotic cameras that have pan/tilt motors and zoom lenses. The most notable examples of these cameras include Sony, Canon, Panasonic, PTZOptics. There once was a time when the most common solution for video was to have an operator “man” each camera and physically have to operate the various shots using tripods, dollys, etc. But in recent years, PTZ cameras have quickly become a go-to video solution for many different industries because a single operator can control multiple cameras and achieve camera angles not possible with conventional tripod setups. We see PTZ cameras being used in a variety of industries, and have worked with churches, universities, hospitals, and businesses needing to connect and control PTZ cameras for livestreaming, broadcasting, and recording their production. Whether it’s to stream a church service, broadcast a college football game, market your business or stream a corporate event, PTZ cameras are a convenient and affordable option for organizations big or small. Although PTZ cameras have become popular, there is often confusion in how to connect them, control them, and integrate them into various configurations. That’s where Rocosoft Hardware and Software Solutions come in and help bridge the gap in connecting and controlling these wonderful cameras. 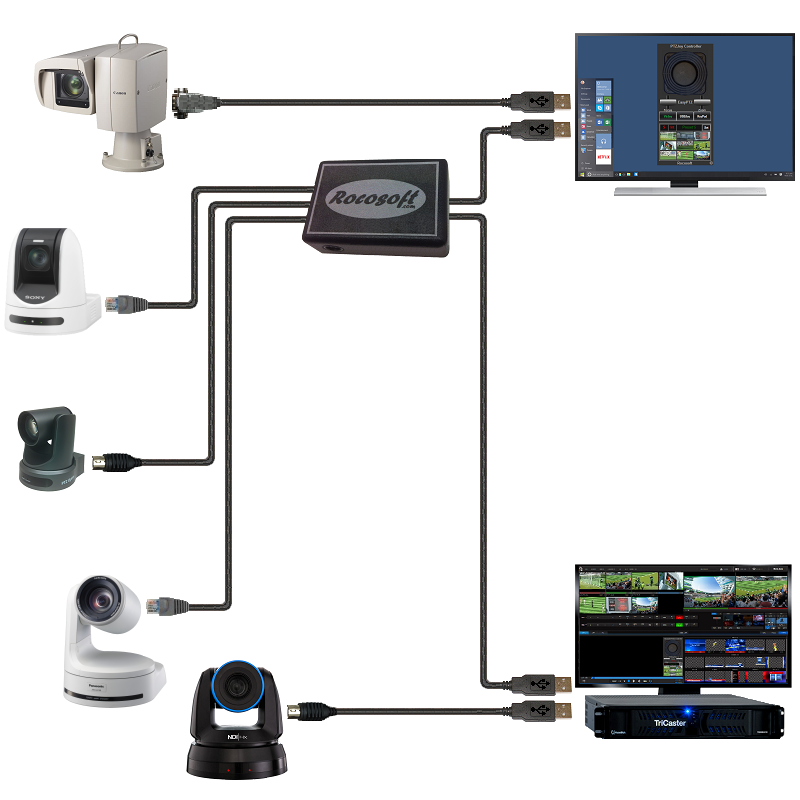 This post will go over some things to consider when setting up a live production setup and go over the options we offer for connecting and controlling PTZ cameras. First thing's first, you have to choose the type of PTZ camera that will best work for your setup. There are many factors that go into making this selection including video output, cost, connection type, and camera specs. The main thing to consider is what type of video signal you will want to use, which will often times determine the cost of the PTZ camera. The standard video options are SDI, HDMI/DVI, and composite video – SDI being the best video quality, and usually most expensive option. Another thing to consider with regards to video quality is the length of the cabling. HDMI, although a cheaper alternative to SDI, tends to require shorter runs so you do not run into decreased video quality. Another completely separate point is that nowadays, many PTZ cameras on the market are moving to IP connection where the cameras are connected to your hardware via Wi-fi, LAN, or WAN connection. There are many pros to using IP cameras, mainly the ease of connecting the camera, so definitely something to consider. Just like with “manned-operator” cameras, the video feed from a PTZ camera must go somewhere so you will have to choose a live production switcher. There are many options available out there, from NewTek TriCaster dedicated live-production systems to software options for a regular Windows computer like vMix Live-Production Software. What you ultimately choose to use depends on the scope of the production, cost, number of cameras and video inputs needed, and the availability of any additional effects that you want such backgrounds, overlays, etc. This is probably the single most confusing part of any setup and where most of our clients get stuck and end up finding us. Tipically, wired PTZ cameras need a connection for video, control, and power and most conventional products treat these as separate issues. We see this all of the time – each PTZ camera has a separate cable for video, a separate cable for control, and then is somehow connected to a power outlet somewhere. Because of the distances involved, this is often easier said than done since you may have your control station at one place, your power outlet in another, and having to take into consideration video signal length limitations. This issue is compounded when you have multiple cameras that all need to be ultimately connected to your live production systems. And with multiple cameras, you also need to consider whether you will be connecting each camera in a “home-run” connection to your system or connecting the first camera directly and “daisy-chaining” the other cameras. In the above diagram, we have an example of our single and multi-cam VISCA RS-232 Control/HD-SDI Video/Power Cable for a single camera (on the top) and multi-camera (on the bottom) setup. The example shows how our solution allows you to set up connect your cameras to a live production system like TriCaster or vMix using a single extendable cable set for control, video, and power. Take a look at the multi camera setup on the bottom. Our product has a main multiplexer module that connects to the live–production system and then at each camera location there is another module that connects directly to the camera. Each camera connects to the main Multiplexer module with a single network cable that is extendable up to 1000ft. This is just one example of one option we offer. We have single and multi-camera options for connecting PTZ Cameras to the serial port of a computer, live production system such as TriCaster or vMix, as well as to joystick controllers like Sony RM-BR300 and RM-IP10. Furthermore, we have control cable sets for every type of standard video signal that I mentioned earlier, various serial port connection types including USB, DB9, DIN 8, and RS-232, and RS-485, and can connect up to 7 cameras with one set. So no matter what type of PTZ camera and video format you choose, we have a solution for your specific setup. Click here to learn about all of our options. So you have all of your equipment, you have connected your cameras, now what? You need to control your PTZ cameras. It used to be that you had to buy additional hardware such as TriCaster’s dedicated control surface or purchase a Sony RM-BR300 Joystick controller. 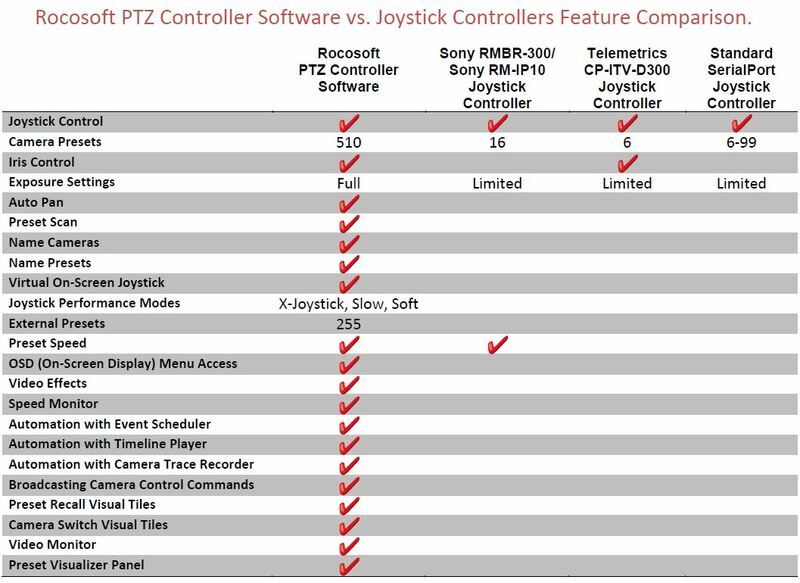 While these are viable options, they are often pretty expensive and are still limited to simple PTZ controls, camera switching, and preset management. Another option is to use you live-production system’s built in PTZ control (if it has one) to control the basic pan, tilt, zoom functions of your cameras. This option may work if all you need for your live production is to pan your camera left and right and zoom in and out. However, what we see with most of our clients when they come to us is that once they purchase all of this expensive professional equipment, set everything up to create a stunning live production, they still lack a professional PTZ control solution without paying an arm and a leg for dedicated hardware that still lacks functionality. 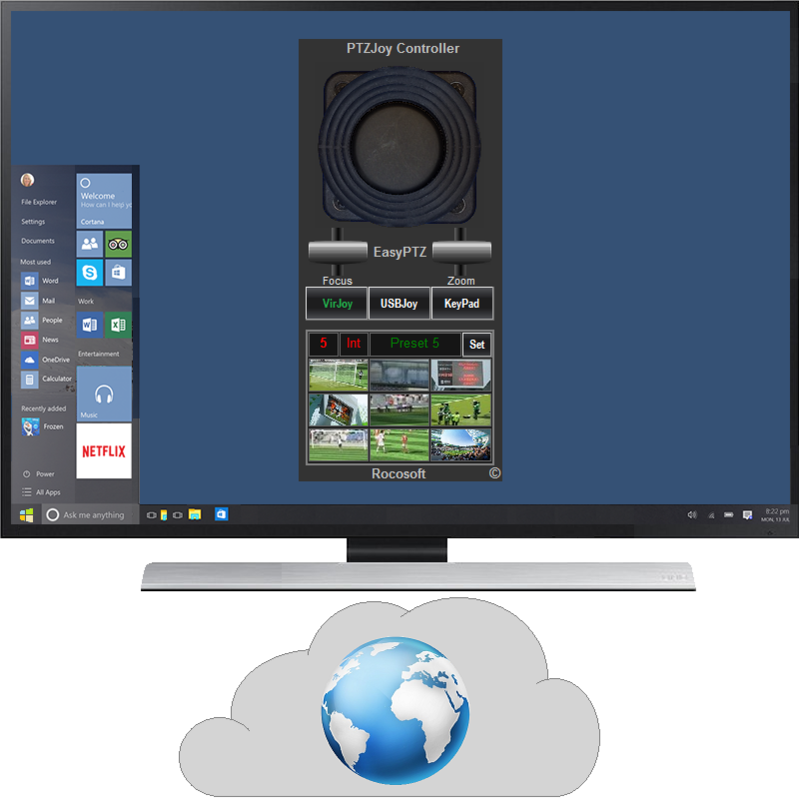 Our solution is a professional ptz camera management software that integrates directly onto your live production system and adds advanced PTZ camera control options, powerful preset tools, and camera automation technology to your live-production. As you can see, while professional joysticks provide users with basic PTZ camera controls and preset management, our software offers functionality and features that unveil the true possibilities for robotic PTZ cameras. It will literally turn your live-production system into a complete, professional camera management system. If you work with presets in your setup, you will likely agree that your existing joystick is bulky, inconvenient and not easy to use for preset switching. Not to mention those long lists of connections between the preset numbers and where the camera will actually go if you dial that number, which creates a constant fear of failure due to pressing the wrong button. With our software, you don’t have to worry about that anymore. Our advanced preset management tools like visual preset tiles and the PTZPad Visual Control Panel are extremely reliable and will make you forget about those preset lists and fears of failure. With visual access to the camera positions that is fully customizable and easy to use, you will have a handy preset organizer that offers a simple yet streamlined preset management solution. If any of the products discussed in this article have gained your interest, feel free to take a look at our Store. We offer both software and hardware that focus on making it easier to control PTZ Cameras.